IS THERE GOOD INTERNET ADVERTISING? Good ad experiences power an open and accessible web, where interested users can access diverse content regardless of their individual ability to pay. Bad ad experiences – those that annoy or attempt to take advantage of users – threaten this ecosystem by disrupting this relationship between users, content creators and brands. The research set out to define what constitutes bad advertising. Nearly 10k people participated in the study using desktop and mobile devices. The results were remarkably consistent – it wasn’t the content of the ad that made it bad; it was how it was displayed. Ads that “interrupt, distract, and prevent user control” were consistently perceived as bad. Examples were “ads that pop up in the middle of reading, ads that can’t be dismissed before a countdown or ads that take up a high percentage of the content on a page”. On the other hand, static and fixed placement ads, small sticky ads at the bottom of mobile pages, immediately rendered ads with no countdown and ads that seamlessly coexist with content are strongly preferred by consumers. In fact, most consumers have a level of familiarity with internet advertising such that when ads are unobtrusive, their experience of pages with and without ads is not significantly different. Take, for example, the “sky scraper” ad format – this is the type that appears in the right- or left-hand column alongside the main content. It is a common format used by local authorities on the Council Advertising Network. 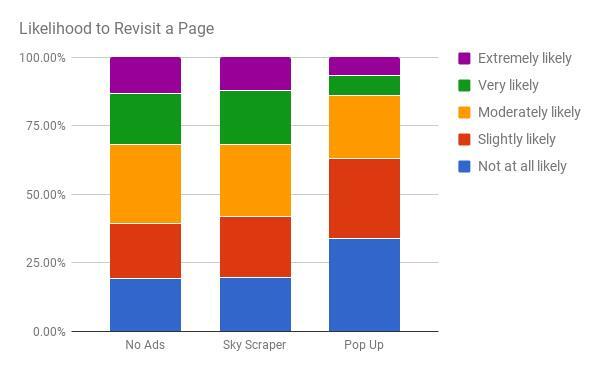 The chart below shows how likely participants were to revisit content when it was displayed with “No Ads”, a “Sky Scraper” ad or a “Pop Up” ad. Negative perceptions increased dramatically when the page contained a pop up ad, but were surprisingly similar when no ads or only a sky scraper ad appeared. 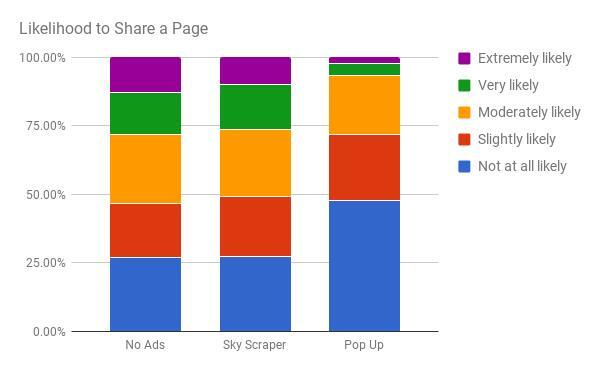 Likewise, when asked whether they would share a page, participants reacted quite negatively in cases where the page contained a pop up ad, but pages with no ads and a sky scraper ad prompted a comparable response. For a small number of people, any advertising is bad, but that is certainly not the norm. Most of us – in fact, the vast majority – are fairly tolerant of advertising when it is displayed well. When ads begin to have an impact on user experience, however, the pendulum swings significantly. Publishers have focused on implementing ad display strategies to meet the twin objectives of paying the bills and having, at worst, a neutral impact on readers. Each publisher employs an approach that works best for its content. Those with unique material or functionality may well push the boundary with higher impact advertising in order to generate more income; while those publishers that have content that is widely available are likely to prioritise user experience. The approach taken by local authorities on the Council Advertising Network is clearly focused on the user. The number and placement of ads are designed to ensure the user is able to access content and carry out transactions without disruption.